Η Σαντορίνη είναι ένα νησί το οποίο εντυπωσιάζει απο τη πρώτη στιγμή τον επισκέπτη της, καθώς είναι διαφορετική από οτιδήποτε έχει συνηθίσει ο μέσος ταξιδιώτης και οι παραλίες της δεν θυμίζουν σε τίποτε τις παραλίες που μπορεί να συναντήσει κανείς στα υπόλοιπα νησιά του Αιγαίου πελάγους. Αν και η σύγκριση και μια τόσο περιορισμένη κατάταξη είναι πολύ δύσκολη αποφασίσαμε να σας παρουσιάσουμε τις 5 δημοφιλέστερες. Το Καμάρι βρίσκεται στο ανατολικό κομμάτι του νησιού και είναι μια από τις πιο δημοφιλείς και πολυσύχναστες παραλίες της Σαντορίνης. Feeling in a party mood? 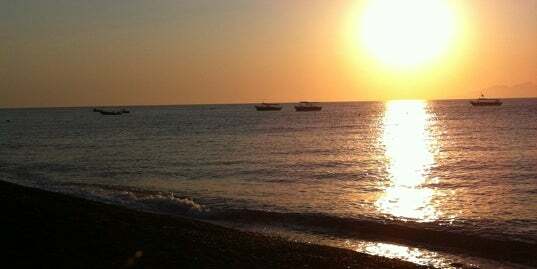 Want to meet new people, enjoy water sports or simply get immediately after landing to a beach? You'll understand why it's the most beloved place for a swim once you visit it! Lots of Ho Mo's in Kamari Beach..
Black coloured wide spread beach. Well organised, lots of sunbeds and umbrellas, cafeterias and restaurant. Pedestrian road all across the beach, perfect for relaxing walk. Since we have small kids and the water wasnt calm we got a bar with the pool. Very relaxing atmosphere on this beach. 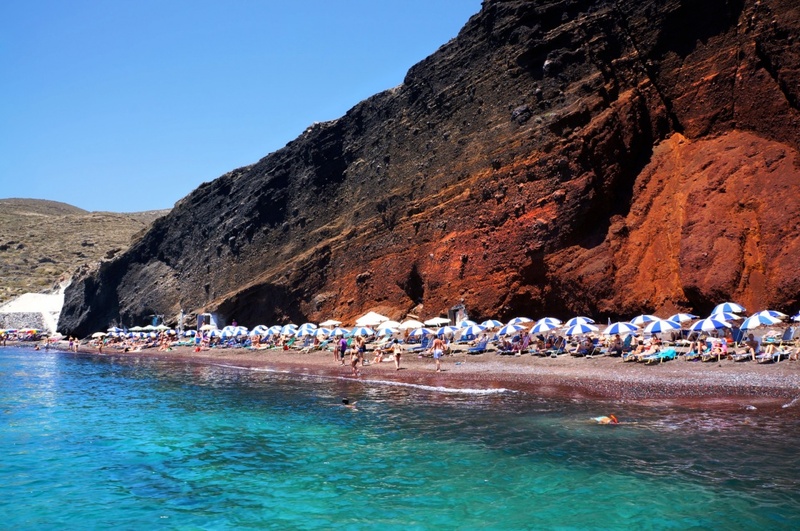 The beach is the best in Santorini, every restaurant located there, however, is very touristy and should only be visited if you are very very hungry. 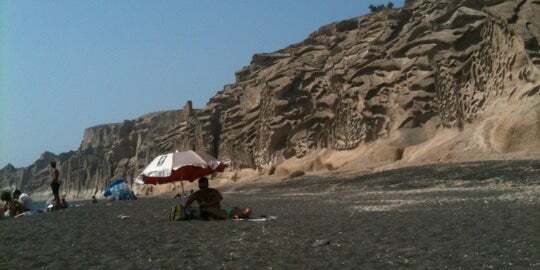 After Perissia beach, that's the second better beach at Santorini. 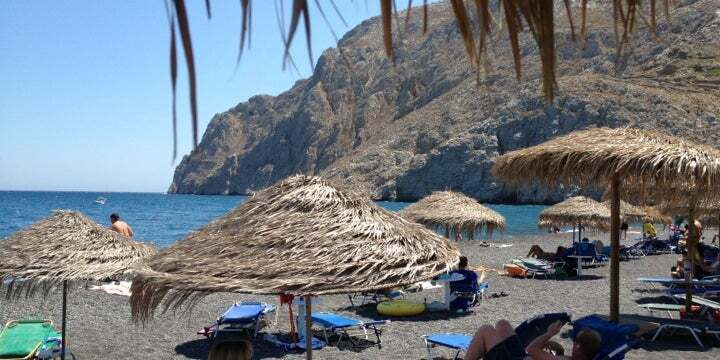 There are many options of restaurants at the beach and the beach beds cost 5 euro for a couple. 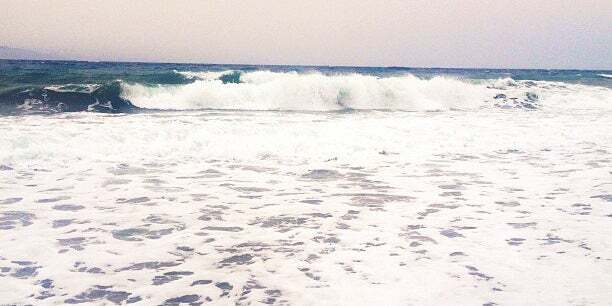 Muy linda playa de piedritas negras (no es de arena). El agua es transparente, y un poco fria, al menos en Junio. Cuidado con las piedras al entrar al agua. Μια πολυ καλη διοργανωση τουρνουα μπιτς βολλευ υπο την αιγιδα της μπυρας βολκαν και του α.ο. Θηρας!! Μία παραλία με μαύρη άμμο λόγω του ηφαιστείου η οποία έχει βραβευτεί με γαλάζια σημαία. Τα καταγάλανα νερά και η μαύρη άμμος συνδέονται άριστα και προσφέρουν ένα τέλειο τοπίο. Η παραλία προσφέρει τη δυνατότητα για πολλές θαλάσσιες δραστηριότητες. Calm and quiet for a resort beach. The water is crystal clear and the water sports options for the kids excellent. Nice place!!! Not so crowded!!! 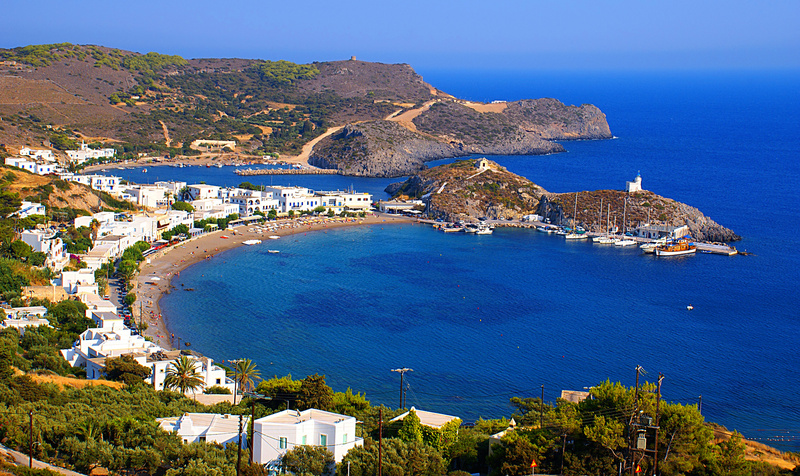 One of the best beach in Santorin! Try Jet-Skiing! Stone beach, way too hard to lay on a simple towel. 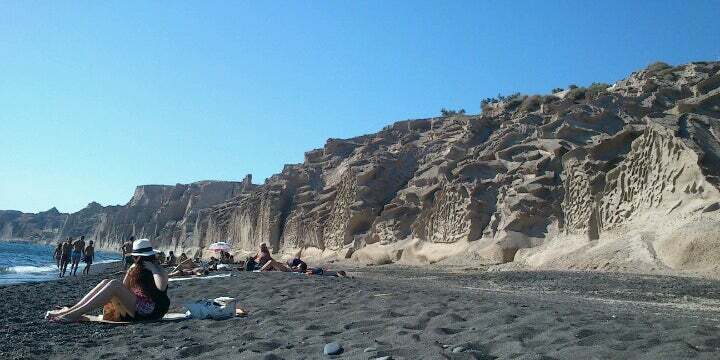 Great beach but don't forget your shoes, the black sand is super hot. The beach is great! 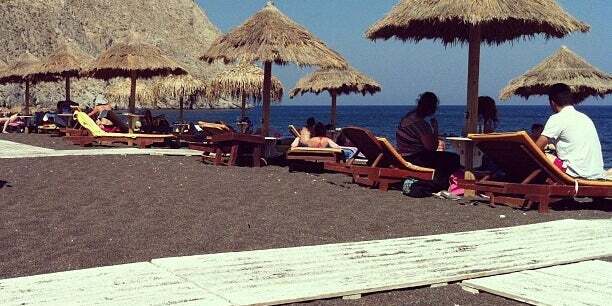 The black hot sand is warming you up. Water is amazingly clear. You'll never wanna leave the place. 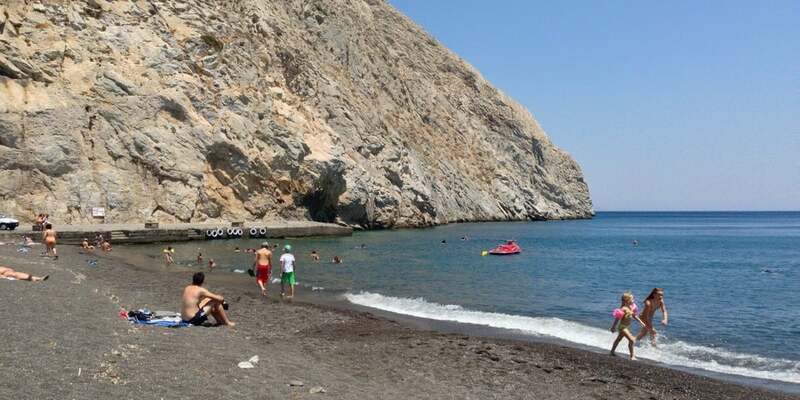 An excellent beach for swimming but be careful with the hot sand! Enjoy! 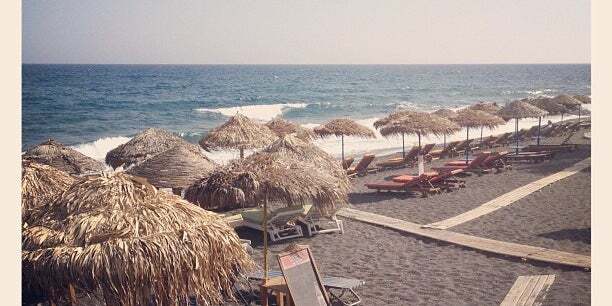 Black sand and incredible crystal-clear waters. What else would you ask for? Ίσως η πιο ατμοσφαιρική παραλία του νησιού, η Βλυχάδα θα σας χαρίσει απλόχερα την αίσθηση πως βρίσκεστε σε… ταξίδι στο φεγγάρι. Sunbathe with your other half in your birthsuit and let go of worries and tanlines! Nice beach with calm waters! 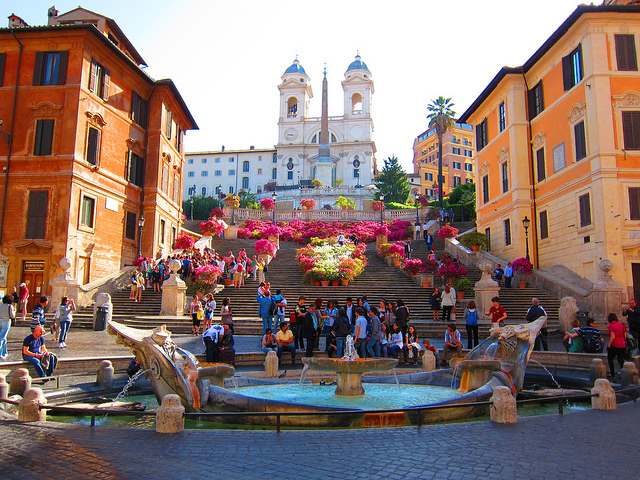 Shallow waters, which are not rocky at all! A Snack-Bar with fair prices and a traditional family tavern are also to find there:) it's very quiet, but a bit windy. 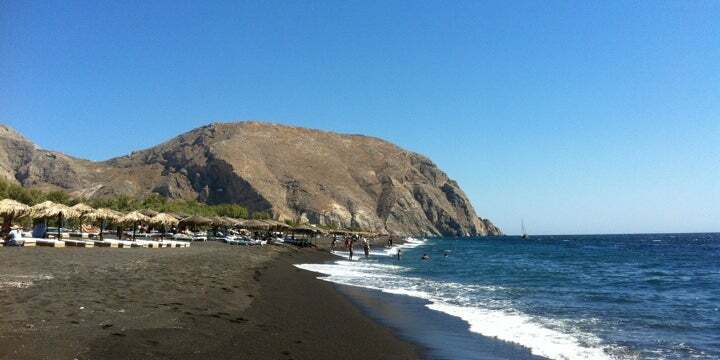 One of the beaches with black sand; it actually has soft black grains of sand. Very comfortable, unlike other beaches with pebbles & rocks. Excellent beach with relatively few tourists. The water is perfect for swimming. 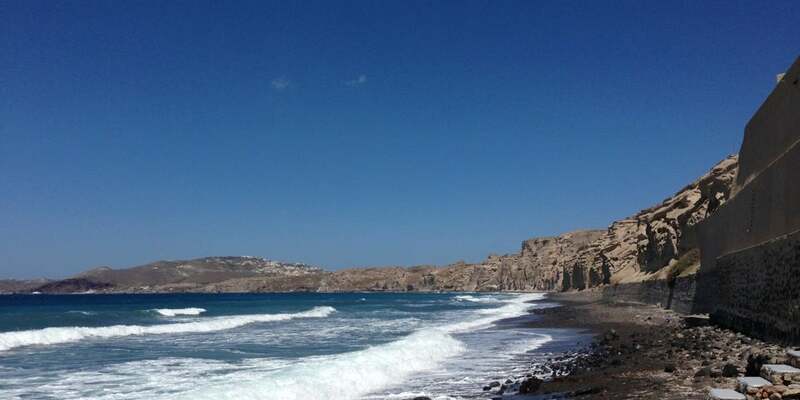 An unmatched and unique beach of Santorini!amazing landscape.visit it even if it's winter.not very touristic! Amazing scenery but rocky sea. 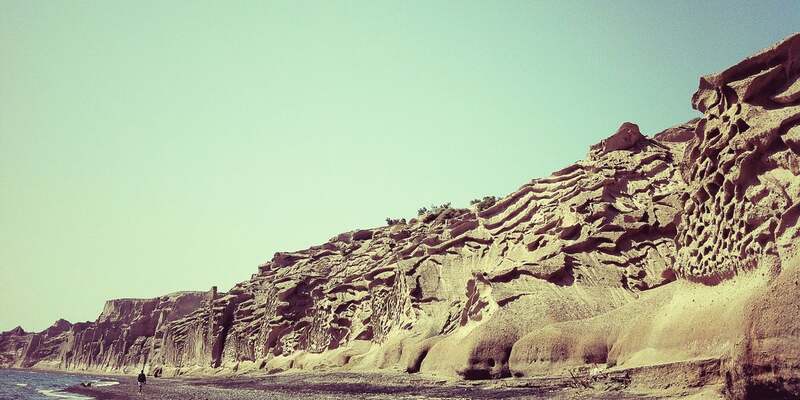 One of the most beautiful beaches on this planet, yet it feels alien. The way the wind has carved into the mountains is so majestic. Mesmerizing really. 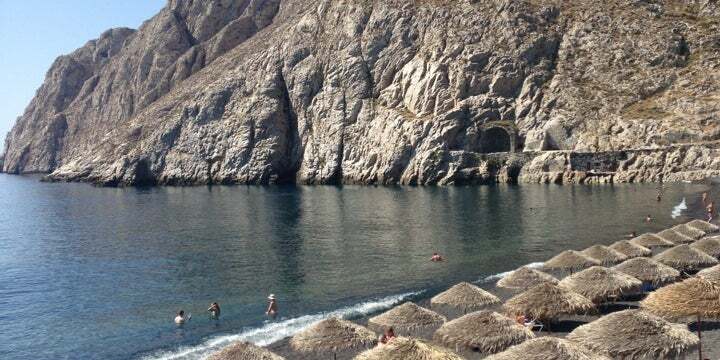 Organized in a lange part, Vlychada Beach is famous for its cliffs and its cliffs and sandy waters. At parts it also accomodates nudists who wish to sunbathe without swimsuit lines! Απλα ξεχαστειτε και δεν πατε, καθαρη παραλεια, ασπρομαυρη αμμος(!) και βραχια. οπως δε.ν τα εχετε ξαναδει. 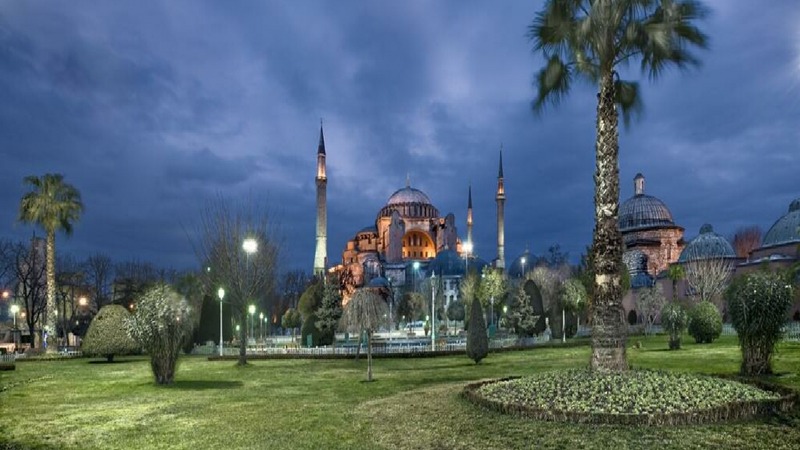 Είναι μια πολύ μικρή παραλία, με άσπρα βότσαλα και πολύ ήσυχη. Λίγες μόνο ξαπλώστρες και ένα μικρό μπαράκι φροντίζουν να καλύψουν τις ανάγκες σας. Ο μοναδικός τρόπος για να φτάσει κανείς εδώ είναι δια θαλάσσης. A true paradise! Rent and umbrella and relax. Pay attention to the stones, they are very big! 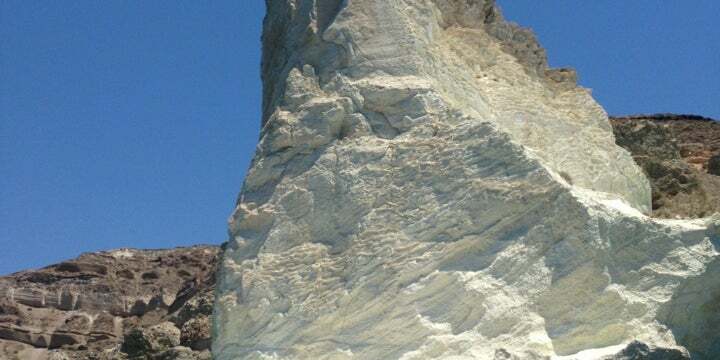 Naturally created from volcanic eruptions a long time ago! 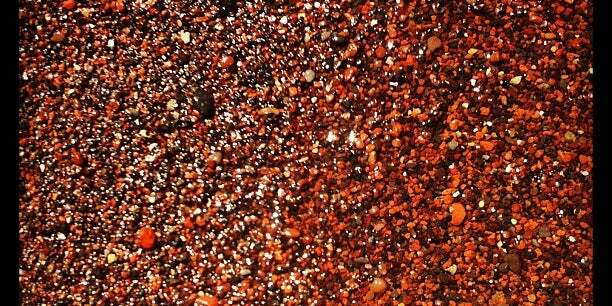 Rocks are white and sand is mostly black pebbles. 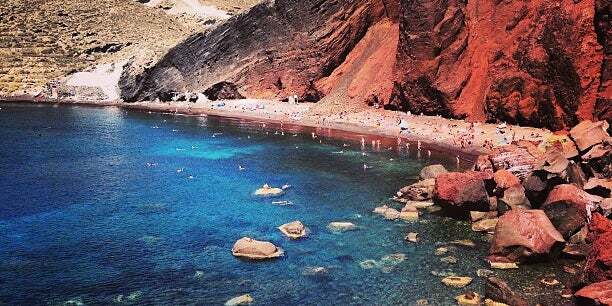 You'll need to take a boat from the Red Beach to get here as it is not accessible by land! 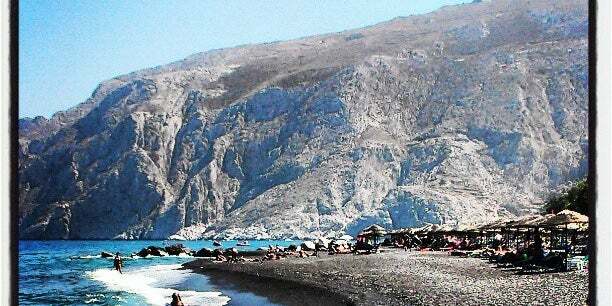 One of the three unique beaches. 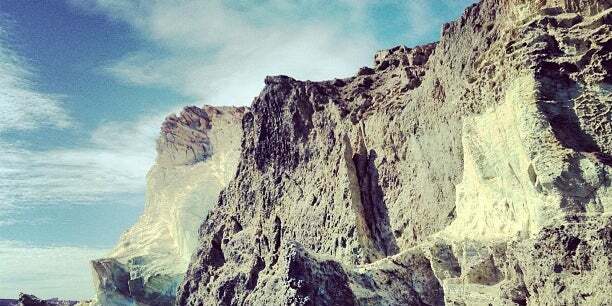 Amazing scenery and a view you don't forget. Reachable only by boat. 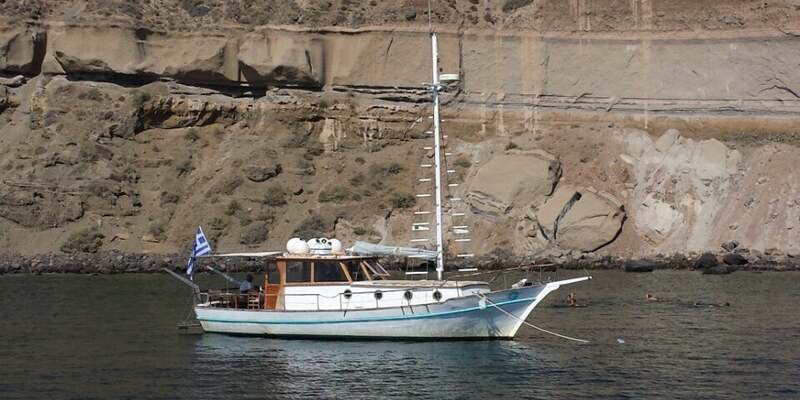 Accessible only by boat, with shallow water that's very warm in the summer. 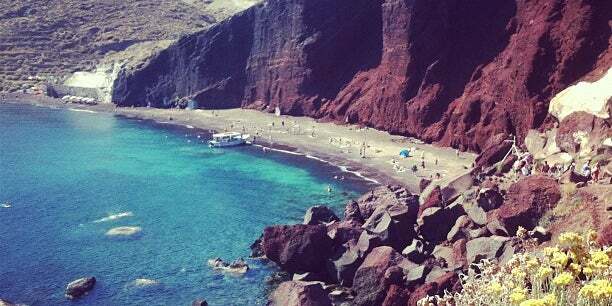 You can catch a boat from the Red Beach - don't forget to bring your own supplies. Some say it's the best beach to go for a swim, others, that it's the best place to take photos, most agree that it is the best place. Period. 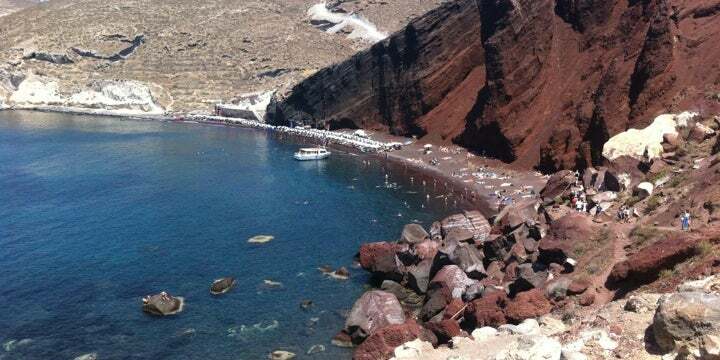 Maybe the most exotic beach of Santorini! Ideal for private moments with your other half! 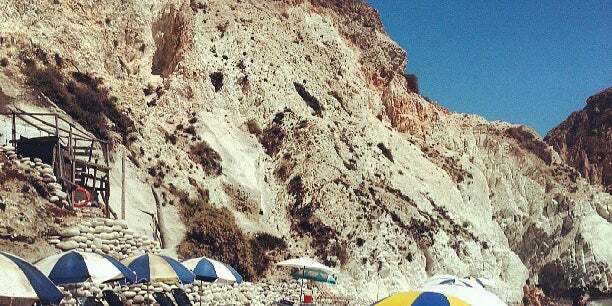 This beach is called white because of its white cliffs, its white pebbles and sand. A unique experience to live with your significant other. 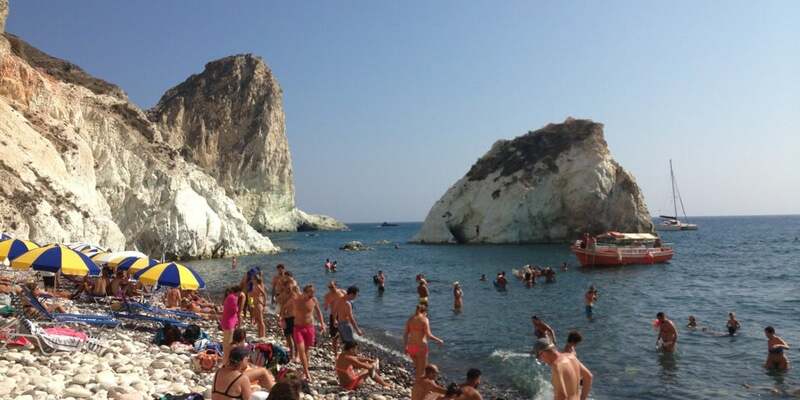 Great beach in a cove for utterly romantic moments. 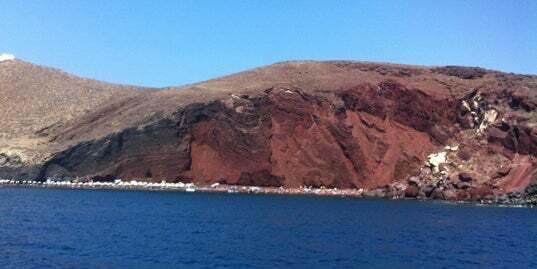 The cove right next to the Red beach is known as the White beach. 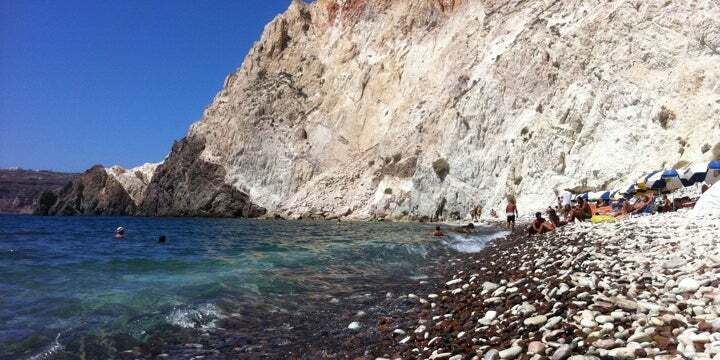 It is very similar to the Red beach, with black pebbles on the shore, only that the surrounding cliffs are white. Meravigliosa caletta raggiungibile solo via mare (qualche metro in acqua dalla barca, assolutamente sicuro per fotocamere e altro). Parete di pomice bianca a picco sul mare (bellissimo). Top! Not worth the trip! Crowded with Italians, no wind and the water blurry! There are better places than this! Bike or a quad is a must or a smart car. Parking is a nightmare. Park 800m away and just walk..
Nice but it's quite crowded & the water gets deep close to the shore. Better wear swim shoes when going here, as the pebbles might hurt. The red rock formation were pretty, but that's just it. You can get a boat to the white beach from here be warned that when you arrive at white beach you will need to enter deep water, so protect your electronic devices really well. Bring a spare pair of sandals for the beach but wear walking shoes. The walk is fairly rocky. Not so comfortable. Interesting to see, but you can also skip it. Good to combine it with visiting Akrotiri excavations. It's just something you need to see once in your life! Easy parking and nice water, bring aqua socks for the rocks! 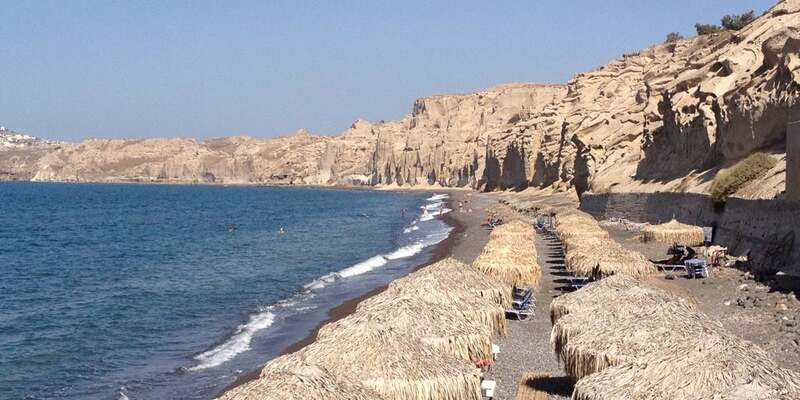 Het rode strand in het zuiden van Santorini. De rotsen zijn rood/bruinachtig en het strand donker van kleur. Μέτρια πράματα , μόνο το τοπίο αξίζει . 7 € οι ξαπλώστρες κ χωρίς απόδειξη.